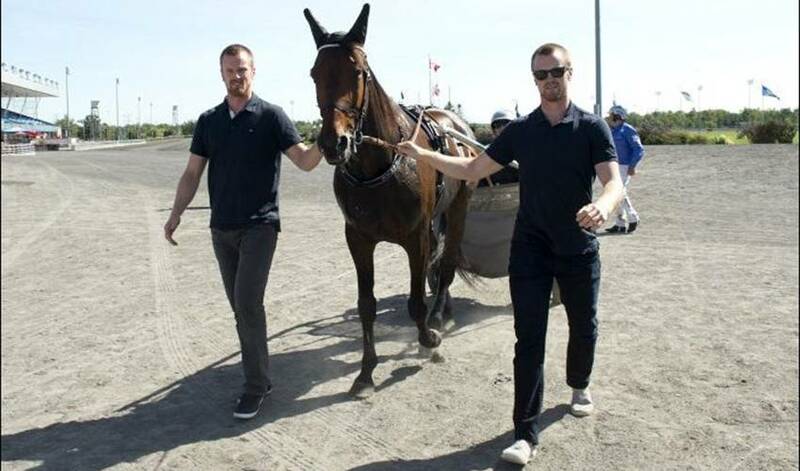 Daniel and Henrik Sedin are hoping to celebrate a win of a different kind one night before Sweden begins their quest for World Cup of Hockey gold. On September 18, the Sedins and Tre Kronor will play their first round-robin game of the World Cup against Russia at Air Canada Centre. Less than 24 hours earlier, the twins will be watching their star horse, Nahar, contest the $680,000 Maple Leaf Trot, one of North America’s premier horse racing events. “Horse racing gives us the same excitement as preparing for and playing a hockey game,” said Daniel in an interview with NHLPA.com. It was former NHL standout and fellow Swede Peter Forsberg who helped spark their interest in horse racing when the brothers played together on Modo in the Swedish junior hockey ranks. Their father, Tommy, is also involved in the sport. He sits on the board of Solänget, a small racetrack in northern Sweden. For several years he sat on the board of Modo, the team he once played for. "We've always had horses back in Sweden," Daniel told writer Bill Finley in a 2015 ESPN article. "Probably the biggest trainer in Sweden right now is Robert Bergh and we have a bunch of horses with him. He wanted to make an effort to get something good over here. He asked us if we were willing to buy a few horses and we did. With us being over here for so much of the year it makes it more fun and hopefully we can be successful." The Sedins have enjoyed success at the highest level of the sport, winning the prestigious 2013 Elitlopp with Nahar, a 39-time winner. "Winning the Elitlopp was a dream come true," Daniel told Finley. "I got asked after we won that race how it compared to winning a hockey game. It's so different because in a horse race you can't do anything about the outcome. You watch, you're nervous the whole day. On the ice, you can do something to influence the result. When you are watching a race it is such an incredible feeling leading up to (the) race and watching them, it is nerve wracking." Which is no doubt what they’ll experience on the night of September 17 when Nahar goes postward in the Maple Leaf Trot, and one day later when they begin their quest to deliver Sweden gold at the World Cup. What makes this particular tournament so meaningful? “The best players in the world are playing in this,” said Daniel. They know they can count on the backing of fellow Swedes. For the Sedins, it doesn’t get any better than being on track for two major wins. From a hometown to his No. 33, it's clear that Vancouver is immensely meaningful to Henrik Sedin in this week’s Player Q&A.